“A Model Home needs to embrace your presence and make you feel welcomed on the spot the moment you walk through the front door. “ Model-Home Interior Design is offered to Builders, Sales and Marketing Development Teams as well as Investors. It is about merchandising a floor plan within a designated residential community, creating a lifestyle for a targeted demographic audience with furnishings, artwork and accessories, and leaving potential homebuyers with a memorable first impression and a sense they could move right in. Our goal is to have homebuyers remember what they saw, talk about the space when they leave, and return to purchase within the community. 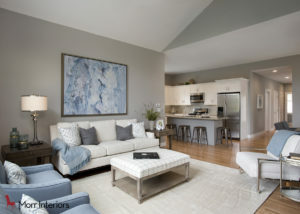 Morr Interiors begins each Model Home Interior Design assignment with an engaging conversation between the development and sales and marketing teams to determine the marketing demographics of who will be purchasing within the community. It is the most important factor in understanding the needs and goals for the site and is helpful in determining the target audience for the demographic area. Next, we begin designing your project complete with furniture and fabric selections per room and create interior design boards to present to you and your team. Once the design has been approved, we handle making the interior finish selections for the home such as cabinets, countertops, flooring, lighting and paint. We take care of ordering for your job and handle the logistics of facilitating a smooth move into the space. Morr Interiors and the sales team will set a target move-in ready date and begin merchandising your model home. Morr Interiors handles the placement of furniture, hangs artwork and window treatments. We take pride in handling the project from start to completion and leaving you with a great sales tool so you can begin selling. Morr Interiors is also responsible in selecting the interior finishes for the model home and can be engaged in selecting the interior finishes to be offered within the entire community. Model-Home Interior Design is for any property that needs a floor plan staged to its utmost potential. Whether it’s a condominium, single-family townhome, or rental apartment, we can help you attract potential buyers and stand out from competition. We strive to create unique, diversified interior design that will be current, fresh, and memorable, as well as highly photogenic for both online and physical listings. Please check out our Gallery to see our Model Homes.